Bernardins Beaumes de Venise Rouge Cru Cotes du Rhone is made from 65% Grenache, 25% Syrah, 5% Mourvedre and 5% Grenache Blanc. Bright ruby color with cherry tinges. Complex black fruit aromas on the nose enhanced by spicy notes. Rounded palate with good length. The wine is drinking well right now and can be kept for another 10 years. Spreads out over the south-east side of the Dentelles de Montmirail hills, in Beaumes de Venise in the southern part of the Rhone valley. On a poor sandy, hungry and arid soil consisting of tender limestone and gritty zones of sandy mollasse. We make two red wines at the estate. Terroir wines shaped by the two classic Côtes du Rhône varieties: Grenache and Syrah. We don’t follow any winemaking recipe but are constantly searching for the perfect expression of terroir and each vintage’s particular characteristics. We don’t go for overripe grapes and over-extraction, as we think the wine has to stay refreshing and balanced. Serve with a meal especially red meat, game and cheese. Domaine des Bernardins is a sixth generation family owned estate on the edge of the tiny village of Beaumes de Venise. The owners are Elizabeth Hall (the granddaughter of Louis Castaud) and her husband Andrew Hall. The area has been populated since the time of the cave dwelling peoples (the name "Beaumes" means caves) who came from the town of Venise which existed near Carpentras. 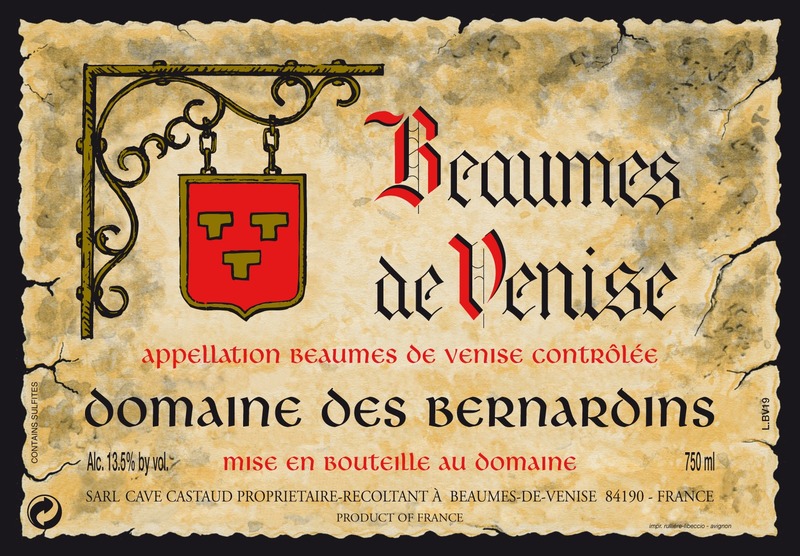 The first Beaumes de Venises granted A.O.C. status was in 1945 with the 1943 vintage. The vineyards consist of 22 hectares (54.34 acres) in total, 15 hectares of Muscat (which yields 30 hl/ha) and 7 hectares of red grapes (Syrah and Cinsault) for Cotes du Rhone Rouge production. Our Côtes du Rhône Villages is elaborated on the superb Terroir. Alain Jaume Cairanne Les Travees is made from 65% Grenache, 35% Syrah, 5% Mourvèdre. Our selected vines for this cuvée are on slopes facing south. Considered as one of the most famous name under the "villages" category, this part of the RHONE may ask to be up-graded CRU level soon. The wine delivers an intensive nose, with loads of black fruits. Starting full and concentrated, with silky tannins, the mouth reveals blackcurrant and a cherry fruit typicity. It finishes with typical notes of pepper and earth. Enjoy with roasted lamb or braised or BBQed pork. gpoes also very well with mild cheese, such as brie or camenbert.